Trullinger House (present Wint) Next to ""Peg Tree"" and old Grange Hall. 1954. J.C. Trullinger house, owner of Oswego town site. Truchot. Friends of LIbrary. OA#128. Description House was originally on the NW corner of Durham and Ladd; then moved to State St. to be used as a Methodist parsonage; and finally to 111 Leonard St. See also photos 1521, 1522, 1601, and 2319. Later also called the Wint House. Written in margin on right side of photo: Peg Tree. Demolished. 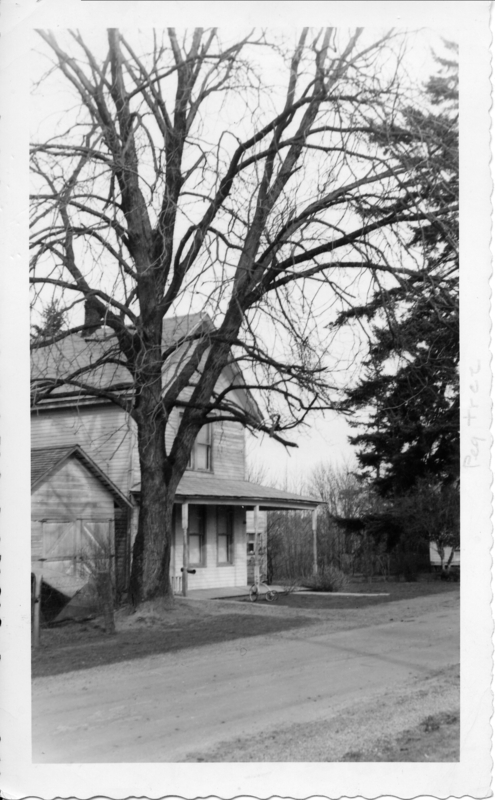 Transcription Trullinger House (present Wint) Next to ""Peg Tree"" and old Grange Hall. 1954. J.C. Trullinger house, owner of Oswego town site. Truchot. Friends of LIbrary. OA#128. Physical Description H 5.75"" x W 3.5""